Like what you see? Like, hit the 'Thumbs Up' button and spread the word! 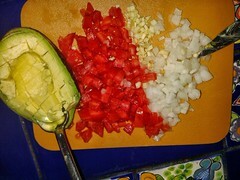 Taco's Latest Adventure: Getting Wholly Fit and Cooking Healthy! Cooking is one of my passions - always has been - ditto for eating! Eating and cooking healthy, on the other hand, was not. Making healthy choices became more of an awareness when Mom came to stay with us for 1-3 months per year; my involvement with WholyFit made me start thinking healthy - and it became a necessity when Vidal was diagnosed with Diabetes in 2011. High blood sugar + high cholesterol = need to re-evaluate eating habits. He said to me that he would gladly change his way of eating and give up eating anything forever - except for my brownies. The challenge was set; the mission to find healthy recipes began. A nutritionist guided us in planning Vidal's daily meals (carb and protein count per meal, hours, etc). During my quest for cooking healthy nutritious meals (low sodium, at that), I decided to 'just say no' to anything canned (waaaay too high on the sodium chart!). I was amazed at how many recipes in 'healthy' cook books and Diabetes magazines/websites have canned and packaged ingredients. Even the Diabetic nutritionist Mom went to talked more about choices in tv dinners and the like! What's the deal, people? While we are fortunate to be living in the tropics, with fresh fruit, veggies and fish available all year round - there are many things on the 'super-duper healthy ingredient list' that are difficult to get here and/or very expensive such as salmon, fresh cranberries, blueberries, walnuts, whole wheat flour and flax seed. Other things like almond milk and Egg Beaters are nonexistent. That just makes it more of a challenge to modify recipes. My goal on this website is to offer the recipes I have tried, and Vidal has given 'thumbs up' to - using all natural ingredients as much as possible. Breakfasts, lunches, dinners and desserts - the healthy way. Aside from balanced diets, we sprinkle our days with exercise (WholyFit - look under Links) and love - essential ingredients for a balanced life! At the top of this message are wise words to live by; reading the Bible nightly is also part of our Daily Diet - our Daily Bread. Scripture may be old, but not outdated as this world seems to think. From another perspective, below is the same verse in other words, from The Message. And with that, I bid you happy reading, happy cooking/baking, happy eating, and God bless you! I don't know about you, but I'm running hard for the finish line. I'm giving it everything I've got. No sloppy living for me! I'm staying alert and in top condition. I'm not going to get caught napping, telling everyone else all about it and then missing out myself. The second time I tried quinoa, it had a better, not bitter taste. I probably followed a recipe that included rinsing the grains (as Cecily also posted on our Facebook page). 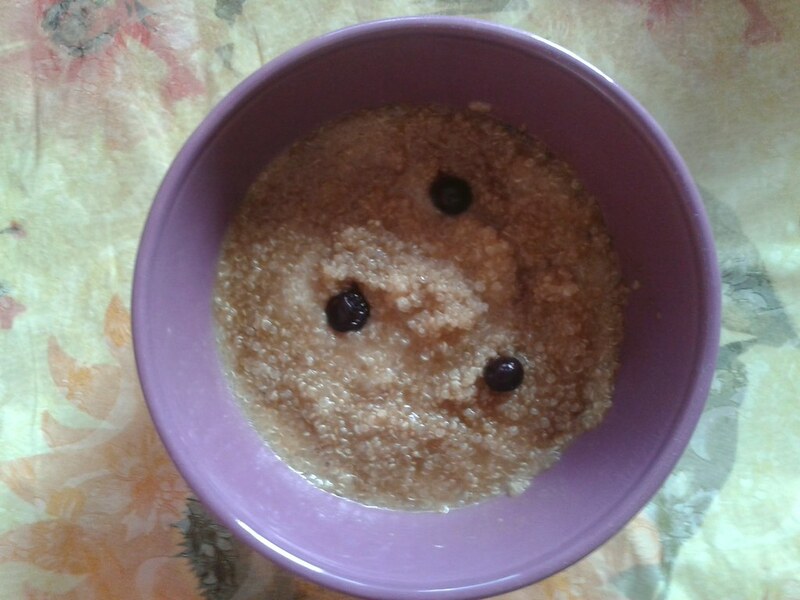 What I remember most is that there was a vaguely familiar taste, like my all-time favorite breakfast, Cream of Wheat. I can still picture my grandmother cooking it over her stove. What warm memories! The following is my twist on a recipe from Martha Stewart; I kept it close to my grandmother’s recipe, hence the butter, as I can find nothing else that comes close to the taste. You, however, can omit it! You will find the link to her original recipe below. Check it out – as it has more links within for other fascinating quinoa recipes! Bring milk to a boil in a small saucepan. Add quinoa, and return to a boil. Reduce heat to low, and simmer, covered, until three-quarters of the milk has been absorbed, roughly 10 - 12 minutes, stirring occasionally. Stir in 1 tablespoon of the maple syrup/agave/raw sugar. Cook, covered, until almost all the milk has been absorbed, up to 5 minutes. Stir in blueberries; cook for 30 seconds. Serve with additional milk, sugar and butter as desired. Enjoy! Everyone who has tasted Vidal's guacamole knows that is is the best, period. He has two secret ingredients: he uses salty cheese instead of salt, and he adds a huge amount of love. We share it here with you, with extra love, and we invite you to come to our home to try Vidal's for yourself! 1 chile (we prefer habanero*), minced (beware: use gloves and do not touch your eyes!) *habaneros are spicy, but adds unique flavor. Chop or mince onion, tomato and garlic, as per above. Cut avocado in half and remove the pit (you can stab it with a sharp knife and pull it out). While still in the skin - chop the avocado by using a sharp knife and cutting the avocado into small squares, without piercing the skin. 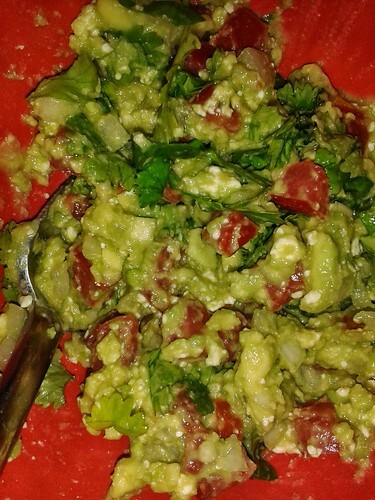 Using a spoon, scoop out the chopped avocado and put in a medium-size bowl. Add the onion, tomato and garlic and mix with spoon, without mashing. Sprinkle half of lime juice over mixture and stir. Add chopped chile, stir. Add cilantro (chopped or torn to size you prefer). Crumble about 2 tablespoons of cheese into mixture and stir. 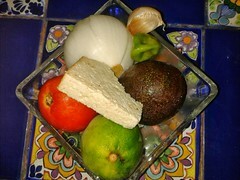 Taste and add more lime, cheese or chile to suit your taste, and don't forget the love! Transfer to a serving bowl and top with a bit of crumbled cheese and serve! 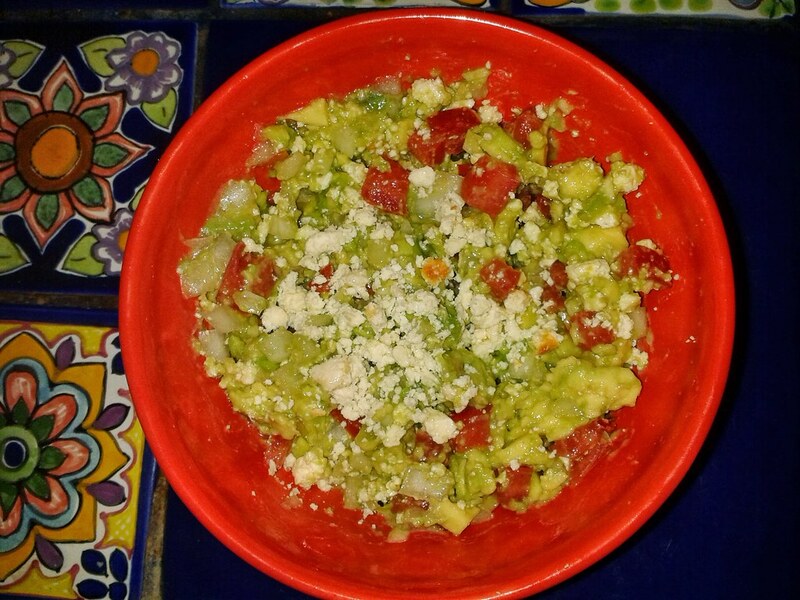 Photo below is very plain guacamole, with no cilantro or chile. Photo at top of post has all ingredients - there you can see how the cilantro adds a beautiful contrast as well as flavor! #1: In the Beginning... There Were Brownies! Not everybody sees the way I do... I need a lot of prayer to remember that every day! What a beautiful message, don't you think? That message can be applied to pretty much anything, but let's stick to food, and more specifically in this post - desserts. There are, after all, people who believe that desserts, outside of fresh fruit, should not be part of an everyday healthy diet - and definitely not a choice for a diabetic, that cookies, cakes and brownies are sinfully decadent, and the thought of offering them to a Diabetic should be a 'Thou shalt not...' as the Eleventh Commandment. I respectively disagree, but will try to remember the Message above and not push my beliefs on anyone. Although I am not saying brownies should be on the Diabetic table daily - I do believe there are healthy, delicious alternatives to all the 'bad' recipes out there. It's just a matter of research, trial and error until you find that perfect alternative. As Vidal is the main reason my whole way of looking at cooking has changed, I decided that my first entry should be his favorite: brownies. Prior to his Diabetes diagnosis, he (as well as friends and family) drooled over my brownies, and it was the only thing he said he cared about possibly never being able to eat again - as if his whole reason for beating diabetes was to be able once more to eat brownies! I tried a variety of healthy recipes before finally finding a good one on Sparkpeople.com (the original recipe was called '103 calorie brownies'). As always, I tweaked it, adapting it to fit our tastes - and made it healthier while doing so. According to Vidal - this recipe is even better than the original brownie recipe he originally fell in love with. Preheat oven to 350 degrees. Spray an 8 inch non-stick cake pan with spray - sometimes I use a small rectangular glass pan; I have even used silicone candy molds to make brownie bites. Whatever works for you! Peel, core and chop the apple and place in microwaveable container with ¼ cup water. Microwave on high for 2 minutes; check and stir, microwave 2 min more as necessary until mushy (*always check to make sure there is enough water - you don't want dry applesauce!). Put in a food processor to get applesauce consistency. In a medium bowl, mix the applesauce, vanilla, egg whites and agave syrup until they are well combined. In a separate bowl, mix the flour, cocoa powder, instant coffee, baking powder, and salt. Add to the above mixture. Add chocolate chips and nuts; stir until batter is just combined and no lumps remain. Pour it into the prepared pan. Bake the brownies for 20-22 minutes or until a toothpick inserted in the center comes out dry.Transfer the pan to a cooling rack and allow them to cool 5 minutes. Try not to eat them all in one sitting - these are best when lots of love is added and shard with others! Seek and Ye Shall Find - search by ingredient or recipe title! Taco's Blog Entry #2: Holy Guacamole! Taco's Blog Entry #1: In the Beginning... There Were Brownies!